But in leaving one's neighbors alone, Americans don't simply forget about them. If those strange customs, rituals, and beliefs enrich and cultivate a neighbor’s home, then they are worthy of respect, even if we know nothing about them. Our neighbor might dance round the fire with his young children nine times each night before bed or eat a birthday cake every day while running five miles each morning. This might even worry us a bit and make us clutch at the curtains or peer out the window (for Americans, though private, are not incurious). But if the fire-dancers and the cake-eaters appear in public, shake hands, and treat us and our family fairly, their homes are worthy of not only privacy but also respect. What strange things my neighbor does is not my business—yet I respect his strange business because I respect him, and I defend his privacy to conduct it. The American Neighbor's attitude derives from a fundamental tenet of America, held since its founding: Americans are united through difference. Going further, Americans are united not by simply tolerating the differences of others but by embracing them and thereby protecting the ability and right of one's neighbor to bring precisely what makes him strange to me into the public square. America made each man the guardian of his neighbor's strangeness and thereby turned strangers into neighbors without destroying or whitewashing what makes each man strange to another. This was an innovation, a new solution to one of the oldest, most fundamental political challenges in man's history and the heart of American exceptionalism. Men have struggled to be both strangers and neighbors to one another at least since biblical times, Rabbi Meir Soloveichik tells his audience in the excellent new online series, "Jewish Ideas and the American Founders," recently released by the Tikvah Fund. The theme first arises when Abraham, seeking a burial place for his deceased bride Sarah, purchases a plot of land to be his family's burial plot. In approaching a people different from him and from whom he will purchase land to be his own, Abraham must be both neighborly and strange—he must be kind and purchase the land rather than kill for it, yet he must insist that this is his land and that it belongs to his people. Rabbi Soloveichik uses the story of the Phillips family—as incredible as Jonas's chapter of the story is, his descendants' is even more astounding—to explain that being strangers and neighbors has always been the Jewish ideal, at least in the Diaspora. 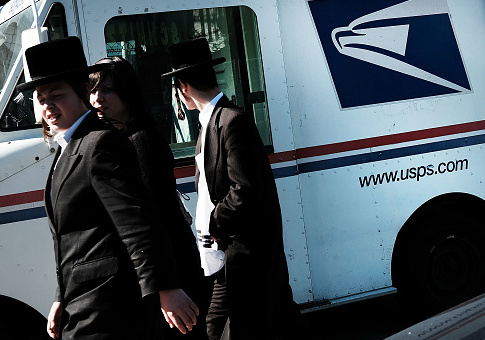 In this sense, America has been the most welcoming country to Jews since the Diaspora began in the first century because it has given them a home without asking, as the price of settlement, that they choose between political engagement and Jewish identity and faith. As important as that is for Jews, Soloveichik also insists there is a universal point, a lesson for all Americans. Americans' being strangers and neighbors to each other simultaneously has succeeded because it is based on the strongest bond known to man: the covenant. A people covenants with one another when they relate to each other just as each individual relates to God. In order to do this, a people must build something together. In the Exodus, God laid out the plan by which the Israelites built the Tabernacle, where God then dwelt. Each person, each part of Israelite society, brought something unique to the construction of the Tabernacle. As God created a world of parts, so the Israelites created the Tabernacle with the parts at their disposal. God made a world for man, and man then made a resting place in that world for God. America's founding is analogous to the story of the Israelites. In drawing out the parallels, Rabbi Soloveichik ultimately asks his viewers to consider not only that the American founding and the subsequent success of the American experiment are based on the pattern laid down by the Jewish people, but that America and the Jewish people, because both are a covenantal people, may share the same divine origin. As the Jews are the chosen people, so the American experiment is truly exceptional. Agree or disagree with that suggestion, Rabbi Soloveichik's teaching on Jewish ideas and the American founding is worth engaging seriously, and there's no better place to start than his new lecture series.